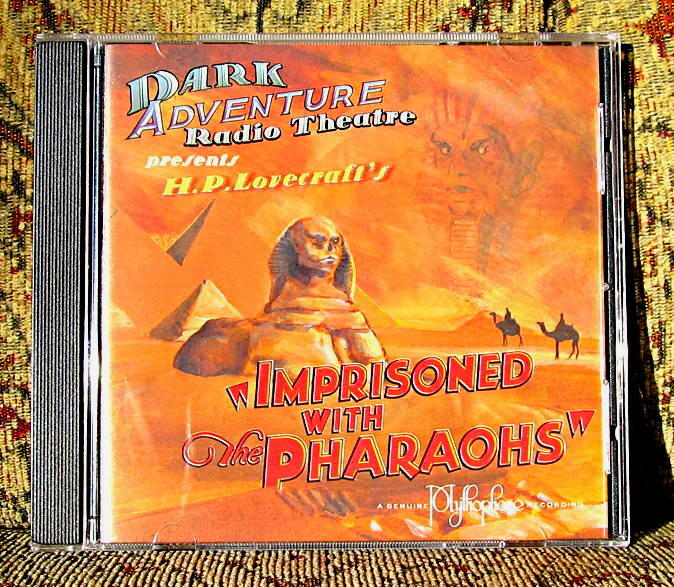 I've long been an admirer of Dark Adventure Radio Theatre. The good folks at The H. P. Lovecraft Historical Society have shown themselves to be reliable stewards of Lovecraft's legacy, and their audio versions of HPL's tales have always been excellent. After a while, though, I began to wonder what they would do once they ran out of Lovecraft stories amenable to radio-style dramatic adaptation. Fortunately, though, the HPLHS have been giving some thought to the very same issue, and they've proven themselves up to the challenge. The two previous DART episodes, Dagon: War of Worlds and A Solstice Carol, took a Lovecraft tale (or three, as was the case with the latter adaptation) and spun out a new story inspired by his type of weird fiction. I'm especially fond of DWoW, since it blended Lovecraft with H. G. Wells and Orson Welles, but I have to admit that the idea of combining Lovecraft and Dickens in ASC was also inspired. I've listened to both episodes many times with great enjoyment. 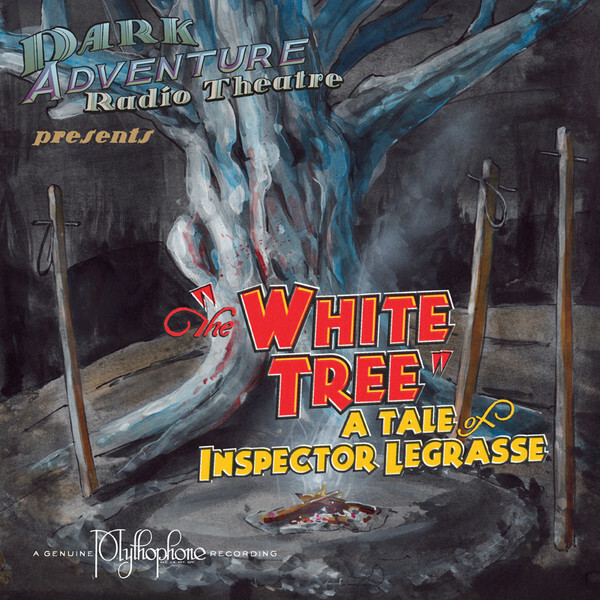 The latest episode, The White Tree: A Tale of Inspector Legrasse, is a new departure for DART. In TWT, the element drawn from Lovecraft's fiction is restricted to a character from a famous tale. Inspector John Raymond Legrasse, who first appeared in "The Call of Cthulhu," heads back to the Louisiana bayou to tangle with a new Lovecraftian menace. The rest of the story is the original work of the HPLHS. According to the credits, Sean Branney, wrote the story and the audio play. He did a bangup job, as far as I'm concerned. Lovecraft's stories frequently involve someone who is professionally drawn to mystery. Usually, these protagonists are scholars, but others with a personally perilous sense of curiosity show up from time to time. Because Inspector Legrasse is a veteran of weird happenings, it makes sense for him to be keeping a weather eye on the local criminal scene for any re-appearance of the Cthulhu cult (or some other equally disturbing occult danger). Also, because he is a police officer, he can believably swing into action and can do so more believably than many of Lovecraft's rather anemic scholarly protagonists. And, finally, he can be thrust into a historical context that includes voodoo and the Ku Klux Klan. So Branney's choice of Legrasse is an especially good one. I heartily recommend "The White Tree" to you. I don't want to spoil the plot, so I won't give away any of the details. Just be assured that, as is always the case with DART, you're in good Lovecraftian hands from beginning to end. Here's a new twist: TWT contains significant characters drawn from the ranks of people who usually have only tiny roles in HPL's tales. Women and minorities, that is. Sadly, HPL wasn't good about this sort of thing. Modern listeners will welcome this development. I'm eagerly looking forward to more new stories from the HPLHS and DART. Lovecraft himself was a teetotaler, but, hey, here's mud in your eye! 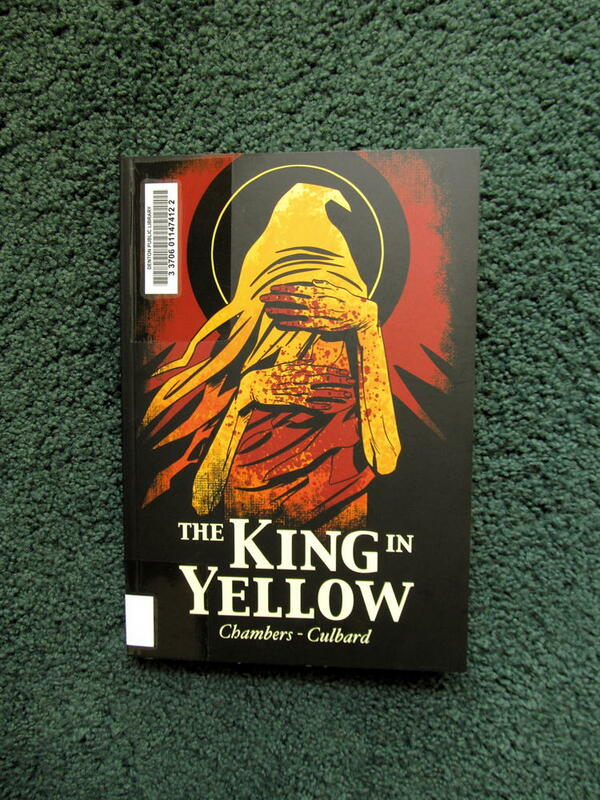 Book Notes: I. N. J. Culbard's Graphic Adaptation of "The King in Yellow"
In an earlier post I explained why I. N. J. Culbard is to blame for my interest in graphic novels. Well, I've been seduced by him once again, this time by his adaptation of a series of stories from a book by Robert Chambers called The King in Yellow. Here are two quick photos of the graphic novel to get you started. The first is a cover shot; the second, a sample of the artwork. There's really no simple way to summarize what Mr. Culbard has attempted in this book, and so I won't try. The original stories are loosely linked by repeated references to a strange play, The King in Yellow, that has the power to drive its readers insane. As you can imagine, each story is suitably bizarre, and Mr. Culbard captures the weird atmosphere with his usual skill. The book was originally published in 1895. (You can find the American edition on this page.) The first four stories"The Repairer of Reputations," "The Mask," "In the Court of the Dragon," and "The Yellow Sign"are the ones adapted by Mr. Culbard, although I see that he has slightly changed their order, which really makes no difference, given that there isn't a continuous plotline that runs from the beginning to the end of the stories. You might be interested to know that The King in Yellow caught the attention of H. P. Lovecraft. (Go to the text of his essay "Supernatural Horror in Literature" and scroll down to his brief discussion of Chambers.) Presumably, HPL knew what he was doing, and since he doesn't discuss the rest of the book, I can only assume that our four stories are the highlight of the book. 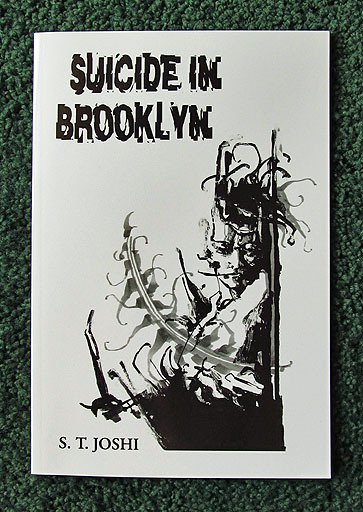 If you like weird fiction, then you'll enjoy the stories as well as their graphic adaptation. You just need to know in advance that they're not telling you a longer tale that somehow encompasses the action of all four stories. If you don't know that, then you might feel let down when you reach the end. One last thing. If you've stumbled upon this post because you're wondering about the relationship between The King in Yellow and the first season of HBO's True Detective, then you should know that reading the stories (or Culbard's graphic adaptation of them) won't help you in the least to understand the TV series. The show's menacing allusions to Carcosa and the Yellow King contribute to the mysterious atmosphere surrounding the investigation into the murder of Dora Lange. But if you ask me, that's all that they do. You don't need to know anything about Chambers to appreciate the show. I've been an admirer of the good folks at The H. P. Lovecraft Historical Society for a long time. Dark Adventure Radio Theatre, their series of radio-style adaptations of Lovecraft's stories, has been great fun, and so I'm always eager to hear the latest episode. But as the years have passed, I've wondered how much longer the HPLHS could continue to adapt Lovecraft in this fashion. After all, he wrote only so many stories of sufficient length to fill an entire CD. Three days ago I was very excited to learn that a new episode of DART is now available for pre-order. I immediately purchased a copy of the CD with props (which, by the way, are always a hoot). Much to my surprise, though, my order included a free MP3 file. So I was able to download and listen to Dagon: War of Worlds as soon as I completed my PayPal transaction. 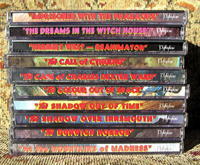 I had thought that the HPLHS, once they ran out of sufficiently long stories, could produce anthology episodes of DART. But what they've done this time around is much more compelling than that. 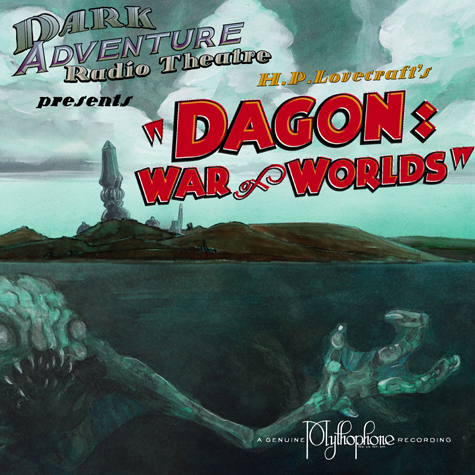 They've taken HPL's "Dagon" (as well as aspects of "The Temple" and "The Whisperer in Darkness") and adapted it in the style of Orson Welles's "War of the Worlds" radio broadcast. I have to say that the HPLHS has really hit a homerun with this episode. The results are vastly more action-packed (lots of gunfire and explosions) than a typical episode of DART. You'll follow with rapt attention as Nathan Reed of Worldwide Wireless News covers the breaking news of a global attack on the surface world. It's really quite a ride that bodes well for the future of DART. I just listened to DWOW a second time, and I'm so worn out from all of the thrills that I'd kill for a bottle of Bub-L-Pep. I recently received my copy of the new Lovecraft variorum edition edited by S. T. Joshi and published by Hippocampus Press. I took three quick photos to get you started. 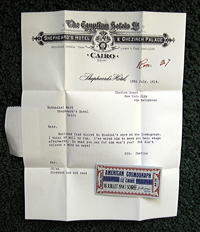 Next, a peek at the text. 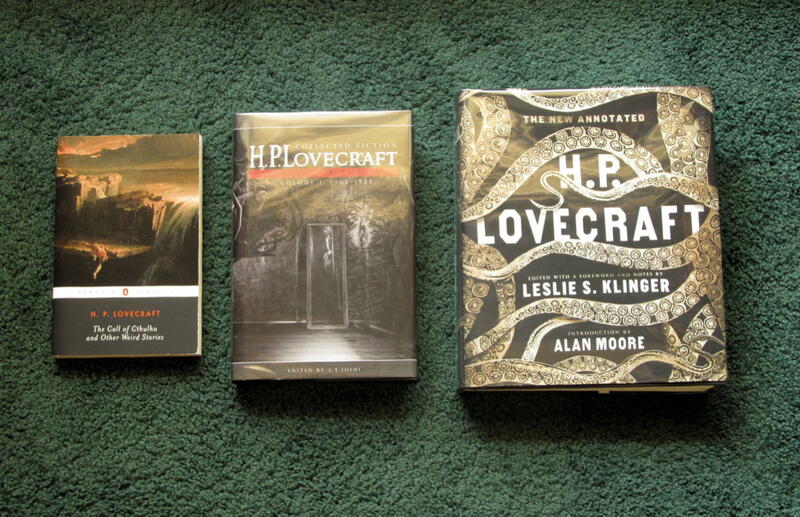 Finally, a size comparison with two other editions of HPL's work. My initial impressions are very favorable. 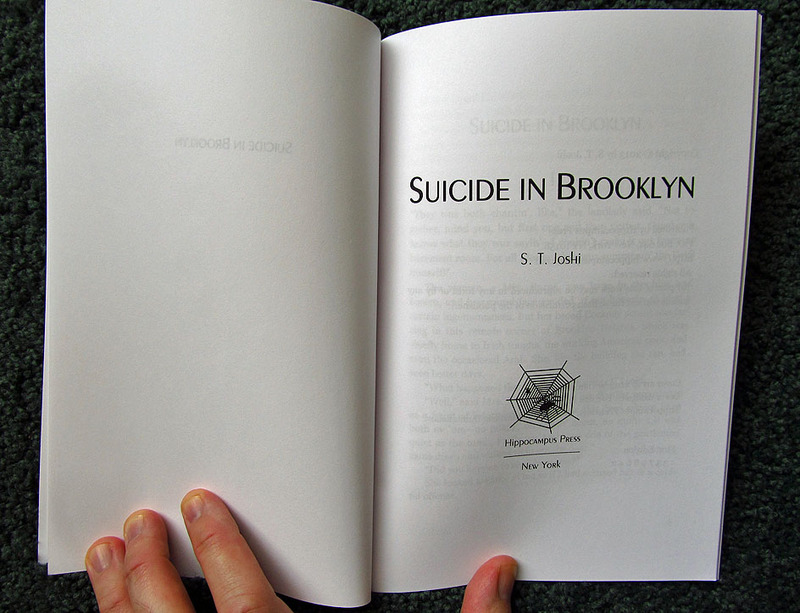 The pages are nicely laid out and the print is large and easy to read. It seems to me, from briefly flipping through all three volumes, that most of the variant readings revolve around spelling. 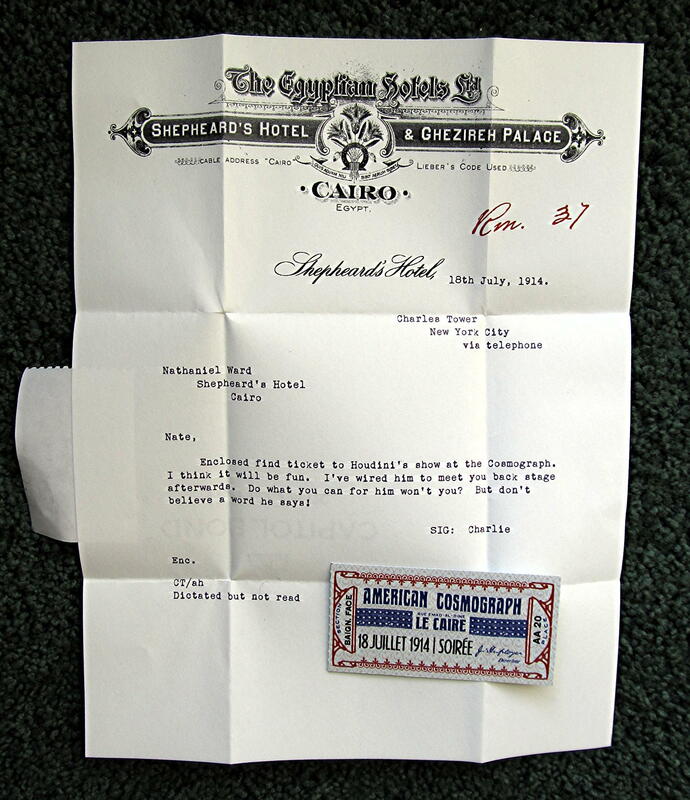 HPL preferred British spellings, but his American publishers tended to change them to conform to American conventions. You should know that this edition is meant primarily for scholars and ardent admirers of HPL's work. Because the hardback edition is limited to 750 sets, it's rather expensive. I can only assume that there will be a cheaper paperback edition at some point. But since this is not an annotated edition, I imagine that most readers are likely to stick with, say, their copies of S. T. Joshi's Penguin paperbacks, which contain useful introductions and explanatory notes. 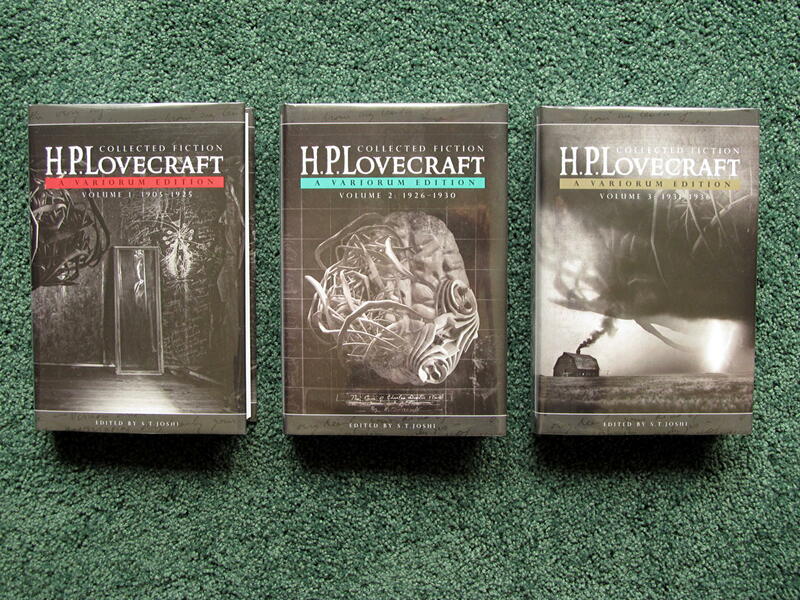 The variorum edition is just supposed to collect the most accurate versions of HPL's fictional works, and nothing more. Anyway, it's good to see HPL's work treated with such seriousness. 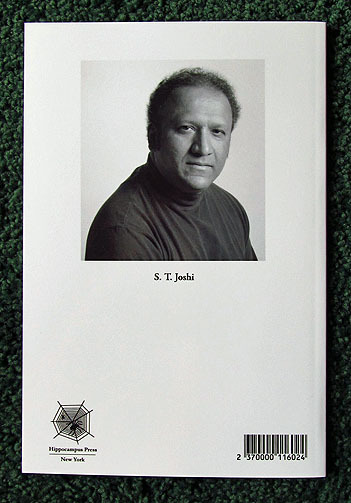 Hats off to S. T. Joshi and Hippocampus Press! Roy Magnuson's "Innsmouth, Massachusetts, 1927"
Surely, this isn't the first symphonic composition (other than film music) inspired by one of HPL's stories? I really don't know. Anyway, in this case, of course, the story in question is The Shadow Over Innsmouth. What fun! Let's hope for more HPL-inspired music from Mr. Magnuson! So, You Think That Your Father is a Lovecraftian Horror? This had me laughing. I've been watching the second season of Elementary, and in the episode entitled "Paint It Black" Sherlock says the following: "My father is a Lovecraftian horror who uses his money to bludgeon his way to ever-more-obscene profits." I can't recall ever encountering a more mainstream reference to Lovecraft than this one. According to the credits, the episode was written by Robert Hewitt Wolfe. Well done, Mr. Wolfe! 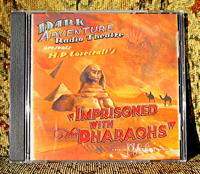 It always brightens my day to receive a new episode of Dark Adventure Radio Theatre in the mail. This time we defy death with Harry Houdini. I mean, how great is that? As you can see, I'm an admirer of the series. 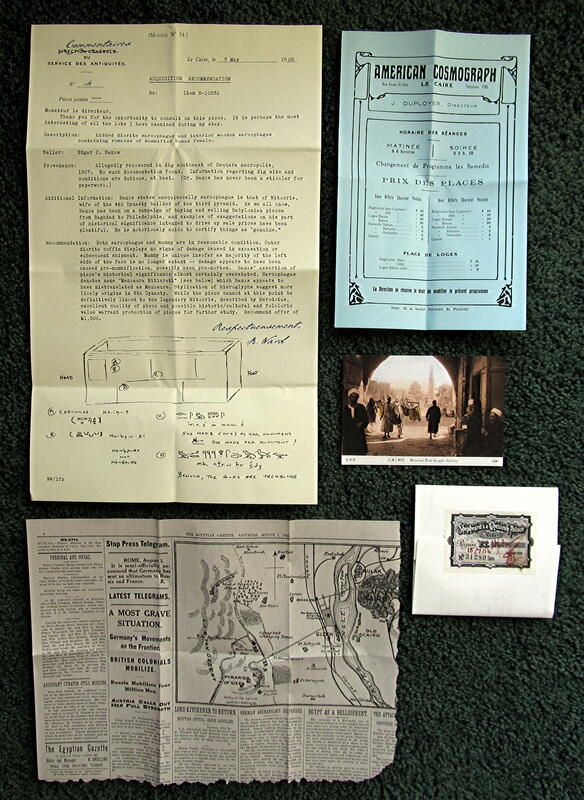 The good folks at The H. P. Lovecraft Historical Society are crazy about props. 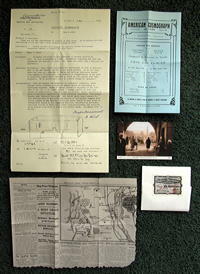 Here are a couple of photos of what you'll find included with your CD. 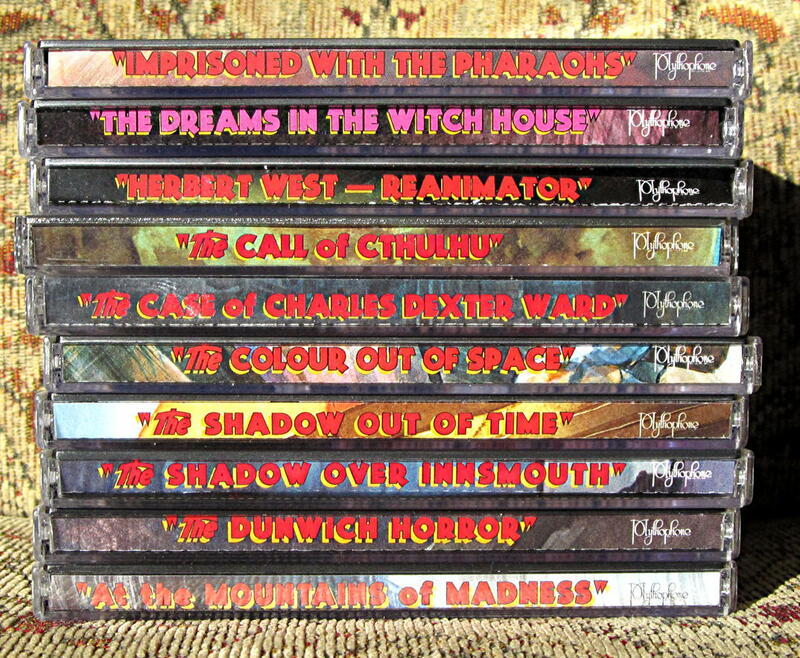 If you enjoy Lovecraft's fiction, then you really should buy every episode of the series. I've been reading Lovecraft since I was a teenager, and so it was probably inevitable that I became a regular listener of The H.P. Lovecraft Literary Podcast hosted by Chad Fifer and Chris Lackey. When Fifer and Lackey discussed At the Mountains of Madness, they were joined by I. N. J. Culbard for a couple of episodes. I learned that Culbard had adapted and illustrated the story as a graphic novel. I was intrigued, even though at the time I wasn't a reader of graphic novels. Years ago I read Art Spiegelman's Maus, and, really, that was it. I didn't know much else about the medium. But I figured that it wouldn't hurt to try another one, and so I ordered a copy of Culbard's version of At the Mountains of Madness. Well, that was my downfall. I thoroughly enjoyed the book, which led me to read more of Culbard's work. Here's what I've bought over the past few years. 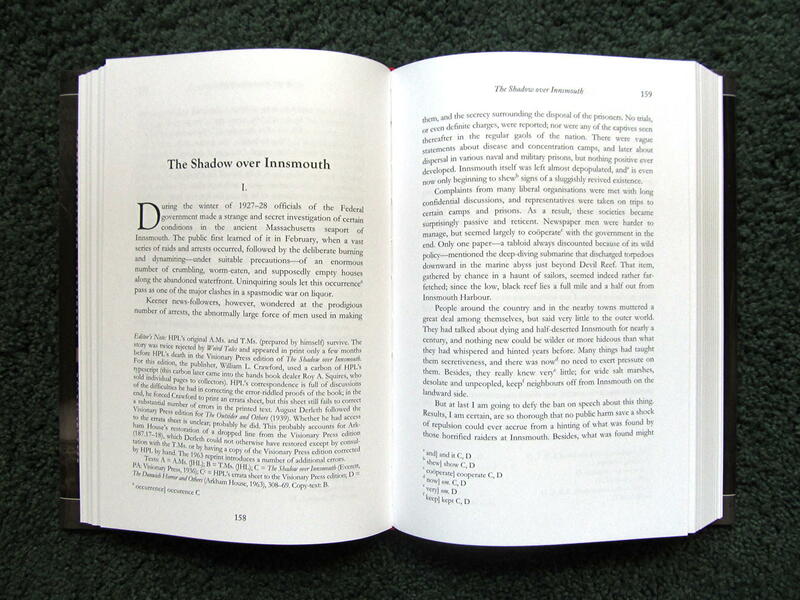 The Lovecraft books in my two photos were published by a British press called SelfMadeHero. 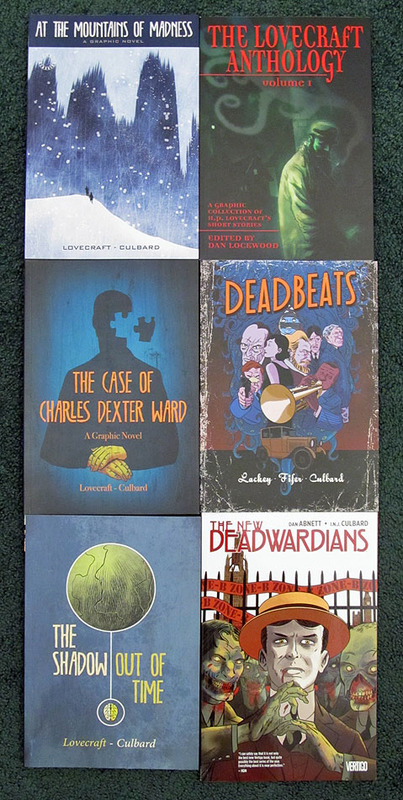 Culbard not only adapted and illustrated At the Mountains of Madness, he also did double duty on HPL's "The Shadow Out of Time" and The Case of Charles Dexter Ward. He illustrated "The Dunwich Horror" in The Lovecraft Anthology, volume one, as well as Deadbeats, a Jazz Age Lovecraftian story dreamed up by Fifer and Lackey. The one non-Lovecraftian book in my photos, The New Deadwardians, is from Vertigo, a DC imprint. It's an alternate history of an Edwardian England populated with large numbers of vampires and zombies. Mr. Culbard illustrated a story by Dan Abnett, whose work was new to me. The murdered corpse of an aristocratic vampire is found on the banks of the Thames. Chief Inspector George Suttle of Scotland Yard, himself a vampire, is sent to investigate, and the story goes from there. Along the way the reader learns many things, but the greatest mystery is the origin of the zombie plague. How this is handled is very clever. My only criticism of the book is that it could have easily been longer, for the setup is so rich that the story could have been spun out at greater length, but as it is the book is a great deal of fun. I recommend it as well. 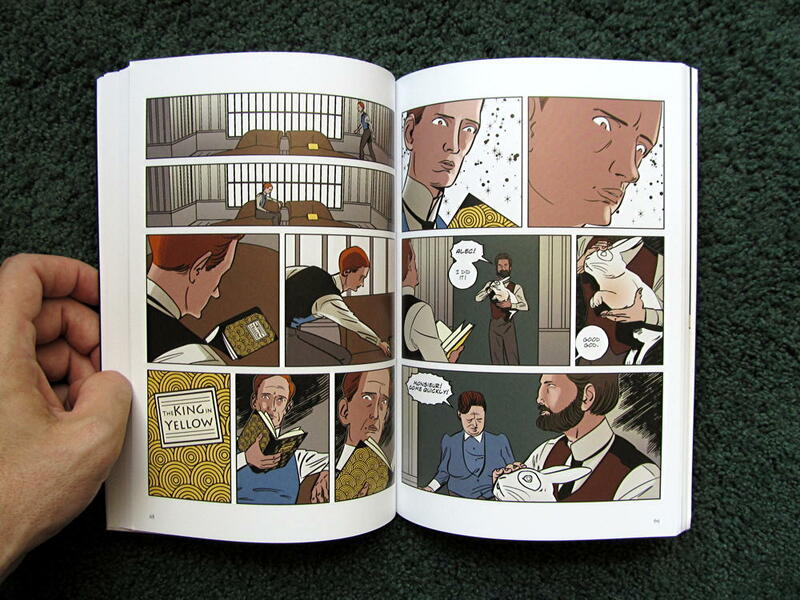 Culbard also illustrated adaptations of Arthur Conan Doyle's four Sherlock Holmes novels. I've read three of them, and they too were very entertaining. I have yet to read The Valley of Fear, but I'll get around to it eventually. My local library doesn't have it, so I'll have to get hold of it some other way, maybe through interlibrary loan. So, you see, Culbard has piqued my interest in graphic novels. I tried to read a few of the DC New 52 books, but I have to admit that they didn't much interest me. I've nothing against superhero stories, but to my eye the artwork is overstuffed, whereas Culbard's visuals don't overwhelm the story and distract my attention from the tale being told. Call me an admirer, I guess. Anyway, what inspired this post was Culbard's explanation of why he adapted H. P. Lovecraft into the medium of graphic novels. I can't say how this decision affected Culbard's life, but it certainly influenced my reading habits. I hope to read more of his work in the future.